Graham shows Zayn some rather dramatic tweets about his barnet. 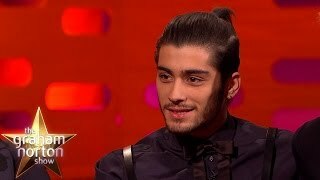 One Direction Read Tweets About Zayn's Hair - The Graham Norton Show by The Graham Norton Show y/o from GB 3 weeks ago . 134,847 views. One Direction Read Tweets About Zayn's Hair ... Graham shows Zayn some rather dramatic tweets about his barnet. ... The Graham Norton Show on BBC AMERICA.